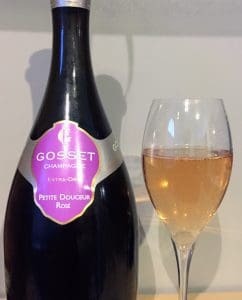 A few quick thoughts on the non-vintage Gosset Petite Douceur Extra Dry Rosé Champagne. Founded in 1584 by Pierre Gosset in the village of Aÿ, long before sparkling wine was produced in Champagne, Gosset is the oldest winery in the region. Since 1994, the négociant house has belonged to the Renaud-Cointreau group, owners of the Cognac house Frapin. Gosset makes around 100,000 cases a year. According to Peter Liem in Champagne: The Essential Guide, Gosset is one of the few major houses (along with Lanson, Alfred Gratien and Vilmart & Cie) that ardently avoids having their base wines go through malolactic fermentation which is usually employed to soften the naturally high acidity of Champagnes, making the wines more approachable in their youth. Historically, Krug and Salon have kept a policy of not encouraging MLF but they don’t take steps to avoid it like Gosset and the other aforementioned houses with the use of temperature control, barrel hygiene, pH and sulfur adjustments. The Petite Douceur Rosé is a blend of 60% Chardonnay and 40% Pinot noir with 7% of Pinot being red wine added for color. The fruit was sourced from the Grand Cru Villages of Ambonnay, Avize, Bouzy and Le Mesnil-sur-Oger and the Premier Cru village of Cumières located in the Vallée de la Marne. The Champagne was aged 3 years on the lees before being bottled with a 17 g/l dosage. Fresh raspberry and vibrant acidity characterize this Champagne. Medium-plus intensity nose. Mix of red fruits–strawberry and raspberry–and floral notes. Also a little orange peel. The red fruits carry through the palate but what is most remarkable is how well balance it is for a sweet Extra Dry with 17 g/l dosage. The acidity is fresh and vibrant, perfectly matching the weight of the fruit and dosage. Smooth mouthfeel and long finish with some spice notes emerging. At around $90-100, this is an exceptionally well made Champagne. It tastes drier and more balanced than many Bruts north of the $100 mark and is a considerable jump in complexity from many $50-80 rose Champagnes. Tagged Alfred Gratien, Ambonnay, Avize, Aÿ, Bouzy, Champagne: The Essential Guide, Chardonnay, Cognac, Cumières, Frapin, Gosset, Grand Cru, Krug, Lanson, Le Mesnil-sur-Oger, malolactic fermentation, négociant, Peter Liem, Petite Douceur, Pinot noir, Renaud-Cointreau, Rosé Wine, Salon, Vallée de la Marne, Vilmart & Cie.